There is no question that the future will run on technology. Innovations in machine learning, big data, blockchain, automation, and the Internet of things have led to its seamless integration into our daily lives, making us more productive and interconnected. But innovation doesn’t happen on its own; it’s driven by people, which is why a future career in the tech industry looks so bright. According to a 2017 study released by the U.S. Bureau of Labor Statistics, STEM-related occupations remain one of the fastest growing job sectors in the U.S. economy at 10% growth over the past decade, double the national average. As the industry expands and creates jobs, tech companies will look more to recent university graduates for new talent to join the ranks of industry leaders, innovators, and entrepreneurs. In an effort to inspire students with a passion for STEM, SAP’s Global Center of Expertise (CoE) in North America has created a talent pipeline to help students along their path towards rewarding careers in computer science and information technology. The CoE’s initiative offers high school students the opportunity to learn about SAP technologies through hands-on activities and receive educational and career guidance from tech professionals that mentor students in the programs. Two such initiatives include the CoE Summer Orientation (learn more here) and the High School STEM Innovators program. High School STEM Innovators is a new eight-week program that provides an in-depth introduction to SAP’s latest products and services along with a full range of training opportunities in technical, business, and soft skills. Students invited to the program are chosen from the CoE Summer Orientation cohort for demonstrating exceptional skill, ingenuity, and leadership. Jacob Smith, now a freshman studying computer science and mathematics at Penn State’s Schreyer Honors College, was among the first cohort to participate in both programs. Jacob first heard about SAP during his junior year in high school when his guidance counselor encouraged him to apply to SAP’s summer program. After a competitive application process, he was one of 12 students invited to attend the 2016 Summer Orientation and was one of three high schoolers invited back the following year as a STEM Innovator. Over the years, what began as an interest in computers grew into a passion. Jacob taught himself how to program his own video games. He took every opportunity made available to him in high school to further cultivate his passion for technology, moving beyond rudimentary program classes to more complex AP-level computer science classes. Jacob attributes his success to his education and the opportunities afforded to him during the summer programs at SAP. He says that his time working in the CoE was a great experience that allowed him to collaborate with professionals and his peers while exploring his personal interests, sharpening his skills, and learning about emerging technologies. Nicholas Zouras is a senior at Downingtown STEM Academy and is the second of three students to complete the STEM Innovators program this summer. Nicholas aspires to study computer science and business, hoping one day to make a positive contribution to society by developing technology that he believes in for the sake of helping to build a better world, just like his icon Elon Musk. Nicholas realized his passion for STEM in part from building robots and developing software as a teen member of the FIRST Robotics program. But it was his hobby building radio controlled airplanes and drones that first peaked his interest in the field of robotics. He is particularly interested in pursuing a career in automation within robotics because he sees robotics as a key to solving innumerable real-world problems. While at SAP, Nicholas explored his interests by developing projects using the Internet of things along with SAP technologies. He applied knowledge from his own experiences to design and help guide his peers in the Summer Orientation through similar projects. He even passed an SAPTEC certification during the program. Braiden Psiuk is a junior at Technical College High School in Pickering, PA. He’s interested in electronics and circuitry. He creates his own circuit boards and uses the Internet of things to connect his projects to a network, which is why he is interested in the IoT. He says that he first realized his passion for STEM during his freshman year in high school after participating in a regional STEM competition through his school and has been hooked ever since. Braiden heard about the Summer Orientation while job shadowing at SAP. He enjoyed SAP so much that he wanted to find a way to learn more about its cloud platform, machine learning, and IoT technologies. He describes the Summer Orientation as the best experiences of his life and says that, although he’s only just beginning his junior year at TCHS, he hopes to find a place at SAP in the future. In conjunction with SAP’s STAR Program and Early Talent Bootcamp, the CoE’s High School STEM Innovators program establishes long-term mentorships between SAP experts and students that will continue through college, helping to jumpstart promising careers in tech. 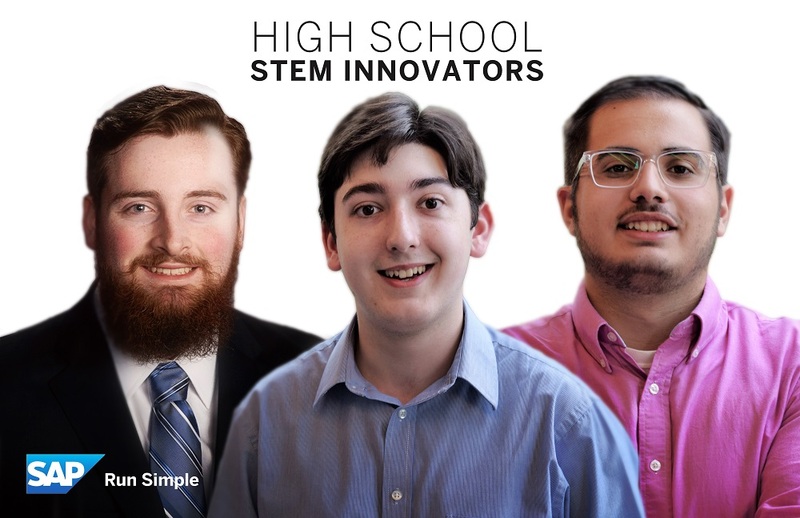 SAP understands that students like Jacob, Nicholas, and Braiden are the future of SAP. That is why the Global Center of Expertise invests in early talent, equipping students of today with the necessary skills to become the industry leaders of tomorrow.